As you are probably already aware, Skybuffer Simple Communication SAP Add-On (/SKYBFR/YCA1) can be used to perform any actions with any business objects in the system. You can record inbound email comments, you can create orders, etc. Now we are going to show you how to create a button in email for any custom action which is not assigned to work item so that we could get a received action and comment in a custom comment-processing BADi. 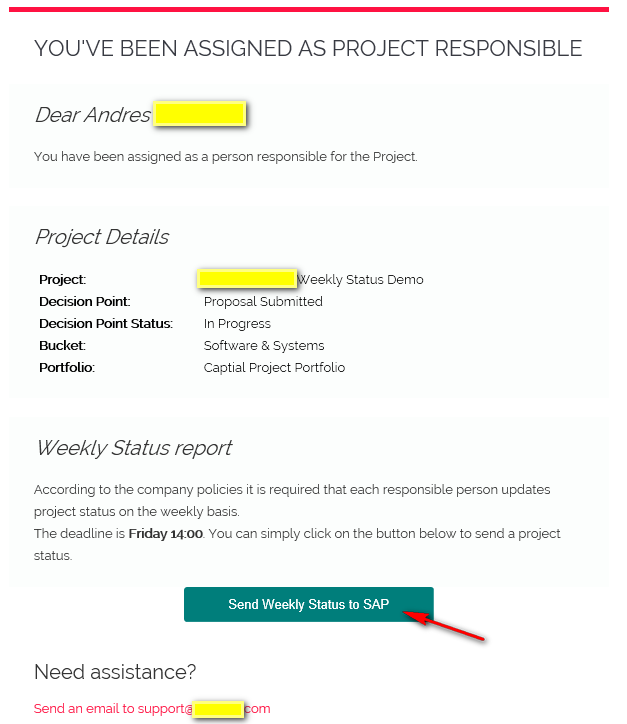 In our case, we have a background ABAP report that sends weekly notifications to Project Managers to update their Project Status. 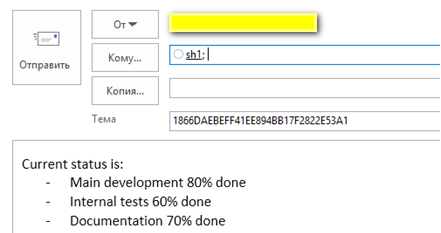 Project Manager can just press Action Button in email, write Current Status and send it. /SKYBFR/YCA1 processes that Action Email and calls custom BADi which writes that Status to Project data. We’ll only show the code specific to this case here. As we can see, GUID is formed in the table and all the necessary information is captured by /SKYBFR/YCA1. Then you prepare and send your email in a regular way using standard /SKYBFR/YCA1 methods. When the button in the email is pressed, and the comment is written and sent, there comes an inbound email and /SKYBFR/YCA1 processes it correctly as any usual Action Email. There are no actions performed, our settings for GOS object type are customized to ban comments and attachments capturing so that YCA1 does not attempt to process them. But we get everything necessary in a comment-processing BADi. In BADi we only implement processing of a necessary type of object according to IF. We parse our encoded keys and find this object. We record a comment where we believe it fits (and/or perform an action for specified Action Code). In other words, we can assign Action Button in Email to ANY custom Object Type and Key. And then parse and process it in custom BADi in the way that suits a particular business case.